Your club's executive officers fulfill various duties from hosting fundraisers to managing hours to creating publications. It's our passion to serve our club members and our local community. Hey KEYuties! 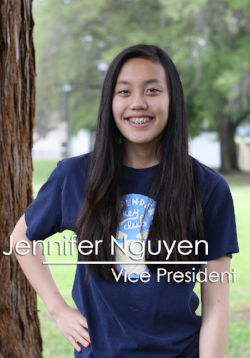 My name is Jenny Leung and I'm beyond excited to serve as your 2017-2018 President. A little bit about me is that I love trying new food (and snapchating it of course), drinking milk tea, and relaxing with a good show on Netflix. I also really enjoy traveling and exploring new places. This term, I hope to promote a genuine passion for service amongst our members and to place more emphasis on leadership within Key Club in order to help shape you all into the leaders that I know you have the potential of being. However above all that, I hope that I can establish an environment where you guys can have fun while building new friendships! If you see me around campus, at a service event, or even at the grocery store, don't hesitate to say hi! Hey Key Clubbers! My name is Jonathan Lu and I am proud to be your 2017-2018 Treasurer! I am ready to make Key Club an awesome experience you won't forget! A cool thing about me is that I love to play water polo! Whenever I have free time, I like to go out for runs, hang out with my friends, go for runs. and eat tacos! Also, I also enjoy watching Black Mirror and Bojack Horseman but I don't enjoy waiting for new seasons to come out. For this upcoming school year, I hope to help our club raise as much money as we can for PTP and MNT . In addition I want to organize lots of delicious fundraisers and come up with more Key Club merchandise! I can't wait to serve and bond with every one of you! Hello to whoever is reading this! I'm Vanessa and I'm your 2017-2018 Bulletin Editor! I'm so excited to create many graphics and videos for Key since I love making those! During my free time, I create digital art or watercolor art and I go on Skype often with my online friends and play games with them! I love listening to indie, alternative, or hip-hop music and artists like Tomppabeats, Jukebox the Ghost, Twenty-One Pilots, P!ATD, and Ollie McKendrick and I LOVE popular musicals! I listen to Dear Evan Hansen, Heathers, Hamilton, and a least popular one but my most favorite, Be More Chill! Also I either watch and cry to Yuri on Ice or wait and cry for the show's 2nd season or movie. I honestly can't believe I made it this far, serving in Key Club as a 2016-2017 Sophomore Class Director to this year's Bulletin Editor! As your Bulletin Editor, I hope to bring my talent of designing onto Key Club and make history! If you ever want to talk to me or geek with me about Yuri on Ice or Musicals, go ahead! I'm a fuse, waiting to ignite!